Struffoli are an incredible dessert coming from the essence of Naples. Those tiny honey balls are in fact tiny fried pieces of dough. The recipe is ancient and simple: you can make it simply mixing up flour, sugar, eggs, lemon and rum. After, once you fried the dough and having obtained a lot of little balls, they will be coated with honey and coloured “confettini”. The size of the pieces here matters: the more they are small, the more they can absorb all the honey you will sprinkle on them. Prepared for the occasion of Christmas in all Campania region, the Stuffoli are an easy recipe and a monumental piece of tradition to taste during Noel! Put the flour on a table or over a wooden piece and pit an hole; in the middle of it add the sugar, the butter, the eggs, the rum, the salt and the grated peel of the lemon. Knead to obtain a nice, smooth and solid dough. Let it stand for ca. 30 minutes. Knead again the dough and cut it in small pieces. Knead each part again, this time try to roll it until you have 10 loafs thin and long. Cut the loafs into small squared pieces (struffoli). Preheat the extra virgin olive oil in a pan and fry in it the struffoli ca. 5 minutes, until they become golden. 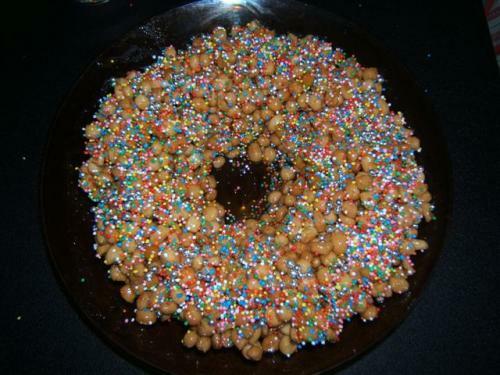 Drain them on a kitchen paper, put an overturned glass in the middle of a dish and place the struffoli around it. In a pan melt the honey and then pour it all over the struffoli. Let the little mountain rest, remove the glass and sprinkle with colored confections. TOTAL COOKING TIME: 1 hour and 10 mins. This entry was posted on Friday, November 30th, 2012 at 5:24 pm	and is filed under Italian Recipes and Food. You can follow any responses to this entry through the RSS 2.0 feed. You can leave a response, or trackback from your own site.